Like any graduate student in Shillong, the only career option for most of us is ‘Government job’. And like any regular youth, you apply all the positions available in the government sector. Yet after sitting through many exams, you are still stuck at home doing nothing. The continuous banter from your parents to get up from your seat and get a job really drives you mad. I started browsing the net and searching for job opportunities anywhere in Shillong. A particular page caught my eye. 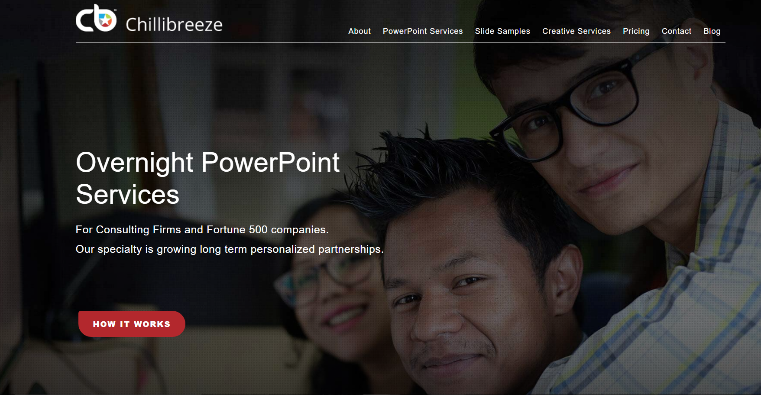 There was an ad by a Shillong design company called Chillibreeze, recruiting for PowerPoint Designer. Since I had a little PowerPoint presentation knowledge in college, I thought “Why not try it out! How hard can it be?” I checked out Chillibreeze and applied for the vacancy. I never imagined that a PowerPoint Designer was even a career option or that it existed as a job! I thought PowerPoint was going to be a walk in the park. PowerPoint is such a powerful presentation program that through designs PowerPoint experts can interpret and transform business ideas into the most creative visual you can possibly imagine. This eye-opening revelation hit me and caused me to ask: How does a person with no designing skills whatsoever deliver PowerPoint formatting designs for customers like Microsoft and PepsiCo? The answer to my question was discovered in the application process. The Chillibreeze HR contact told me they would train me! Preparing for the interview was stressful. After some light research on YouTube, I realized that I did not know much about PowerPoint. I learnt all that I could to prepare for the Interview. The common scenario you may be thinking if you go for an interview is a long queue of applicants waiting for their opportunity, Right? But this was not the case, as I entered the compound I was led into a room where I was greeted by one of the HR. First, I had to take the online test which took an hour. The HR guided me to a room for the online test. It didn’t turn out to be so bad. The time that I spent preparing paid off. On getting through the test, I was directed for the personal interview or as they call it, “the interaction round”. The interaction round was intense but thankfully I made it through. After a few days, I was called for the final round interview. There was a brief interaction and I was informed that I was selected for Chillibreeze PowerPoint training! I was excited thinking about what was in store for me. The training was intense but worth all my time and effort. Chillibreeze is picky for sure. But whatever Chillibreeze decides is for the best of the candidate. If you are a person who is up for challenges, Chillibreeze is the right place for you. A place where you learn and grow endlessly. Here is the Chillibreeze page that changed my life. It was fate that landed me here. It is determination and love of my job that keeps me learning and growing each day in Chillibreeze.